Thanks to Ross Allen for playing this on last week’s Meltdown on NTS radio from Durand Jones and The Indications called Morning in America. Lovely stuff and a tune and a half! One to coax that sun out this weekend. We love that Isley Brothers-like freaky guitar at the end! Thanks to @hincmariana for letting us know about the great free event tomorrow at The Garden Museum. We’ve left it a bit late but it’s an event worth going to if you like a seed swap like we do. And accompanying news of the seed swap here’s a couple of lovely tunes heard on this week’s Ross Allen Show on NTS which has been on rotation here at Weeds HQ. The first is by The Officials called Distant Drums on a very limited Soul Jazz/Studio 1 release. The next is a previous unknown Four Tops track called Don’t bring back memories (we don’t think this was the actual mix Ross played but it is a tune!) Best of luck to all who are going to the seed swap tomorrow! We’ve been busy the last fortnight so we haven’t had much time to garden until yesterday when the sun came out in force. The lawn was mown and the seed spuds we bought from Shannon’s many moons ago were finally dug up. Usually as soon as the plant’s flowered we’re in with a fork pulling up marble sized spuds but this time it’s been well worth the wait! Also we tried for the first time an alternative weedkiller (a strong solution of salt and water with a little dot of washing up liquid) for the cracked pavement out the back. We will revisit the area in a week or two to see if it actually works or it’s back out there on our hands and knees. What’s going on with that weather at the moment? One day you’re in the garden with your jumper off, the next indoors with the heating on. They’ve even talked about sleet and snow at the London Marathon tomorrow. Madness! Well we aren’t taking any risks here at Weeds HQ (above) so there’s a array of tomato plants, a squash, a safflower plant and sweet peppers all being kept indoors until the risk of frost is passed. And look at that Mongolian Giant Sunflower in the centre go! Below: That will be us up that ladder in the summer if the advert for those giant sunflower seeds we bought on ebay for 80p is to be believed. Out in the garden we’ve got some fleece over the spuds (after we earthed them up as extra protection) that are now coming through. Don’t be fooled by that bit of sunshine at the moment as it can still be nippy overnight but give it a few more weeks and all will be well! Soon we’ll be able to put out those Dahlia tubers that are sitting in the corner of the back room that are starting to sweat in their packaging. Talking of Dahlias, have a butchers at The National Dahlia Collection here for a comprehensive list of said plant, there’s even varieties called Punky and Abba but why no Charlie Harper or John Peel? Soundtrack to this post is this classic Babylon from Johnny Clarke that’s being played on last week’s Ross Allen’s Mi-Soul show on Mixcloud as we write. Tune! An excellent tune heard on the other week on Ross Allen’s Meltdown on Mi-Soul. It’s got a nice understated dub and one to whack on loud. A tune to celebrate spring and the good weather to come. But then again you never know what’s around the corner. Three corkers this week, one from the back garden and two from Ross Allen and Andrew Hale’s brilliant show on Misoul available here. 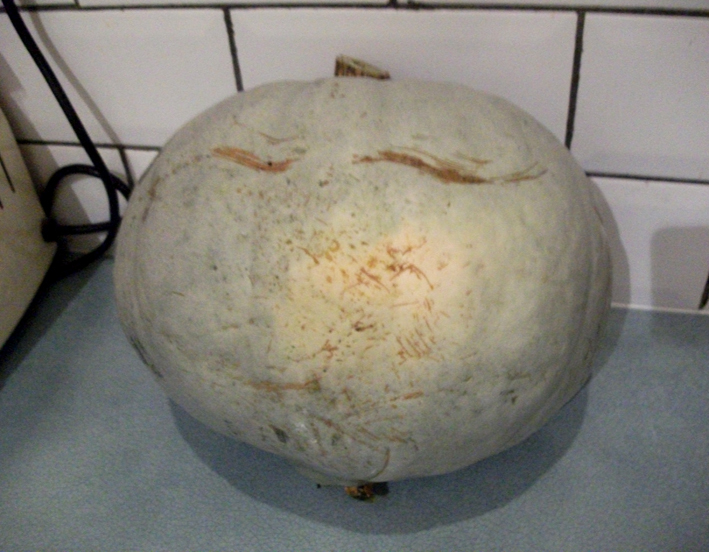 The above is the squash/blue pumpkin harvested this evening. This is the first time I’ve ever had success with squashes, I got this specimen (which was the only one) from a plant that I constantly watered and fed weekly during the summer. It went all sprawling over the shop, but it was worth it for this mad looking thing with weird eyelashes! Big up the squash! And here’s two corkers from Ross and Andrew’s excellent show on Misoul, it’s been a while since listening to it and the first time back I wasn’t disappointed. The first is the excellent Johnny Clarke with Babylon, a Jah Shaka favourite which has a great dub too. Next is a tune I’ve never heard before and one that puts me in mind of Siouxsie and the Banshees “Happy House” and Eddie Kendricks’ “Girl you need a change of Mind” with Liberace at the controls! Don’t listen too hard to the mix as the kick drum is well up front. Two tunes to take your mind of the bad weather of late!